To paraphrase Lionel Hutz, there’s “the truth” about “Realty Bites”: I don’t want to be entertained by Marge Simpson’s quiet despair. [Shakes head.] And then there’s the truth about “Realty Bites”: I am entertained by Marge Simpson’s quiet despair. [Nods head.] By any reasonable definition of the word, it’s not “enjoyable” to see a beloved character suffer like she does here, starting from a point of domestic malaise before getting herself tangled up in a job that requires her to betray the trust of her friends and neighbors. 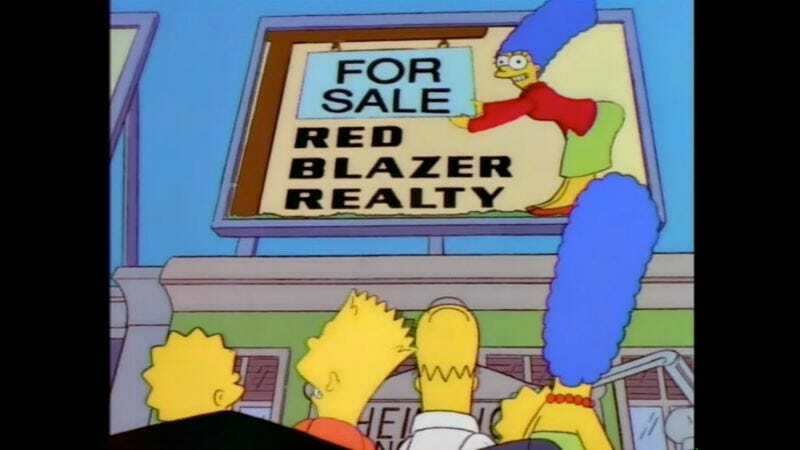 On its face, Marge’s Red Blazer Realty dilemma is more compelling than it is entertaining. But because this is The Simpsons, and because the show isn’t too far removed from its glory days, misery makes good comedy in “Realty Bites.” Following “Scenes From The Class Struggle In Springfield” and “The Twisted World Of Marge Simpson,” this episode draws on Marge’s solitary path without mocking her for choosing to walk it. These episodes expose the difficult truths of Marge’s life, without placing any judgment on her life as a mother and wife. It allows for complexities within her character, complexities that “Realty Bites” and Julie Kavner put to touching, funny use. It’s established quickly that real estate is not a business that suits Marge Simpson. She’s not smooth like Nick Callahan, cutthroat like Cookie Kwan, or desperate like Lionel Hutz or Gil Gunderson. Most damning of all: She’s honest to a fault. When the Hibberds can’t look past the cramped dimensions of a kitchen, neither can Marge. When the facade of a house tumbles, revealing a partially clothed Lenny (“Please don’t tell anyone how I live”), she ushers the Flanders on to the next property on their agenda. During her induction into the Red House Realty crew, the glamour of the gig—the glint of her personalized name plate, the wire wastebasket, and Cookie’s false tooth—builds to an earnest proclamation: “I’m going to do my darnedest to uphold the principles and ideals this jacket represents.” But those principles and ideals don’t square with Marge’s; they’re more in line with the moral gray areas laid out by Hutz. It’s a clever contrast to past occupations that would fit Marge anywhere but her hometown. She couldn’t hack it in the Springfield Police Department because her vision of law and order wasn’t shared by an institution that exchanges drug seizures for drugs; her sympathetic ear, straightforward advice, and willingness to see the best in everyone placed The Listen Lady’s most devoted client in mortal danger. Marge is the town’s consummate straight woman, tremendously grounded for a character whose hair is two feet tall. There’s nothing arch or ironic about her, and if it weren’t for the freaks, fanatics, and Homers she faces everyday, she’d be an incredibly difficult character to write for. And sometimes she is: When “Fear Of Flying” tries to give an explanation for why Marge is the way she is, it falls flat. “Realty Bites” succeeds because it doesn’t invent anything about Marge. It presents a fresh take on the character using the things we already know about her: She’s sincere, humble, loyal, and terminally square. That last quality is easily spun into jokes at her expense, but this episode is careful not to get too mean-spirited about it. When she suggests that she and Homer get out of the house, she’s glumly reading an issue of Vicarious Living. When Lisa proposes setting real estate codes to a mnemonic version of “Camptown Races,” Marge jumps into it with characteristically dorky aplomb. Even her arc within “Realty Bites” speaks to an innately sensible personality: While her wacky cartoon husband is tooling around town in a hot rod with a goddamn cobra painted on its side, she’s exploring a perfectly practical line of employment. But the source of Marge’s frustration doesn’t just reside at 742 Evergreen Terrace. Her conflict here is with a world she wasn’t built for—but Lionel Hutz, Cookie Kwan, and ol’ Gil sure were. It’s funny that Cookie and Gil wound up becoming permanent residents of Springfield, because “Realty Bites” bears a resemblance to old-school back-door pilots like The Mary Tyler Moore Show’s “His Two Right Arms.” Like the campaign office in that episode, Red Blazer Realty comes on to the scene boasting a staff of mostly formed characters and fully formed dynamics. The Simpsons is too sophisticated a show with too much faith in its audience to try a mercenary move like “His Two Right Arms,” but part of the episode’s appeal is wrapped up in the feeling that Red Blazer employees will keep donning the “closer” jacket and stealing Gil’s cubicle walls after “Realty Bites” ends. Sadly, that wouldn’t be the case for Lionel Hutz, seen here in his final speaking appearance prior to the shooting death of Phil Hartman in 1998. Of Hartman’s recurring characters on the show, Hutz will always be second banana to Troy McClure (who you may remember from such upcoming episodes as “Das Bus,” “Lisa The Simpson,” and “This Little Wiggy”), but an appearance by Springfield’s most incorrigible shyster brightens any episode of The Simpsons. He’s the ideal foil for Marge’s attempt to introduce some ethics into Red Blazer’s portfolio, and his sporadic turns into Alec-Baldwin-in-Glengarry Glen Ross territory explain how someone so incompetent could hang on for so long in competitive fields like real estate and the law. Lionel Hutz’ll cut you if he has to. It’s fitting that Hutz’s last hurrah functions as a passing of the torch to a new Simpsons scene stealer. According to show lore (and, you know, the DVD commentary), Dan Castellaneta’s portrayal of Gil Gunderson was such a hit at the “Realty Bites” table read that the writing staff kept coming up with excuses to bring him back in future episodes. It’s not like they’d made a secret of their affection for Shelley Levene types: Jack Lemmon had already reprised his Glengarry Glen Ross role in everything but name in “The Twisted World Of Marge Simpson.” Gil inspires sympathy, but his pathetic sweatiness is too delicious (and too exaggerated) not to laugh at. If “Realty Bites” goes easy on Marge, it compensates by dumping on Gil at every opportunity, his stooped shoulders and loosened tie the result of all the psychic stress (and cubicle walls from home) he’s carrying around. Gil is the most traditionally cartoonish element of “Realty Bites” outside of the consciously Looney Tunes tone of Snake’s quest to reunite with his beloved Li’l Bandit. (He doesn’t just steal Wile E. Coyote’s scheming tip-toe walk—he apparently swipes the character’s Acme catalogs, too.) Homer’s portion of the episode is so outrageous as to feel entirely divorced from Marge’s real estate dealings, but the connections are there: It could be coincidence, but Homer’s new ride is the same color as Marge’s new work uniform. And it’s the color red that eventually slams the two stories together in the final act: The paint in Todd Flanders’ new bedroom, in the home Marge sells to the family under false pretenses (conveniently eliding the grisly murder that occurred there), which is then destroyed when Homer, Snake, Chief Wiggum, and two automobiles come crashing into the front of the house. “Realty Bites” is defined by Marge’s non-adventure, but its climax requires the intrusion from Homer. Thrust into the type of scene he’d normally view from an outside perspective (vertically, on the couch, slurping kernels of popcorn from the bowl perched on his gut), the violence and messiness of the sequence is as quintessentially Homer as broken real estate dreams are quintessentially Marge. This week in Simpsons signage: A lot to choose from this week, but the absolute best pertains to the honor system in place in the jail yard, the sort of policy I feel like Marge (against her better judgment) might agree with. But let’s not deny The Lumber King his propers. Come to think of it, “Realty Bites” is an embarrassment of visual- and verbal-humor riches. 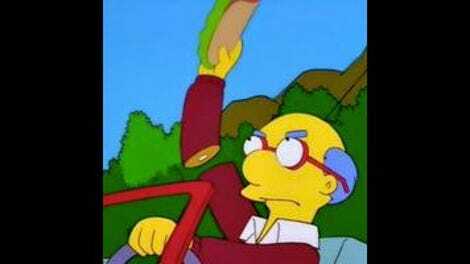 There’s a lot of fun to be had with Li’l Bandit (“Oh yeah, you gotta be careful when you do a trick like this!”), the height of which involves poor Kirk Van Houten and his right arm. Sure, it breaks the reality of The Simpsons, but if a scene’s going to start with a Road Runner homage, it might as well end on an Itchy & Scratchy-style gag. And it’s such a glorious fakeout, with the sandwich getting all the attention in the frame and the dialogue. Bravo, “Realty Bites.” Bravo. Seen in the unemployment line at the end of the episode: Lurleen Lumpkin, Larry Burns, Jimbo (between this and an incarcerated Kearney, “Realty Bites” really lays on the gags about the bullies being older than they seem), cartoon George Meyer, and Kirk Van Houten with his arm re-attached. I could transcribe every bit with the Flanders in the murder house—but why do that when I can post a montage of those scenes? It’s much better to hear “purple drapes” and “torso heap” straight from the horse’s mouth.